Bulletin for PM Trudeau: Angela Merkel, your apparent role model on open borders, has reached an agreement to control future il-legal migrants into Germany on the German-Austrian border, and that’s while she is saddled with the pressure of European Union dictates, to which Canada doesn’t have to answer. If Angela Merkel, the mother of all open borders, can find a way to control future illegal migrants into Germany, Canada can. Don’t tell us that Canada cannot do the same to control illegal migration. 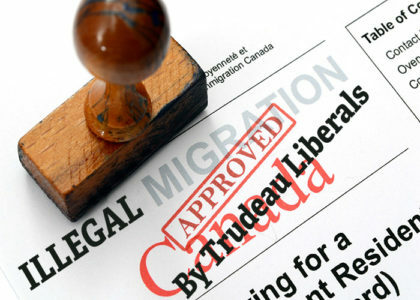 It seems that in truth, the Trudeau Liberals are quite happy to live with the mess of illegal migrants flowing over our border, and consuming our tax dollars when it’s money that should be going to Canadians that we know need our help, like sick kids in the hospital needing expensive cancer drugs, and homeless elderly. PM Trudeau needs to have his license to teach revoked. This entry was posted in Immigration, Politics, Canada, Think Over News and tagged angela merkel, illegal border crossing, illegal immigraiton, illegal migrants, Liberals, open borders, roxham road, Trudeau.